While US GDP growth estimates for the first quarter have been adjusted downward three times, manufacturing production inventories over the last three quarters have improved dramatically. 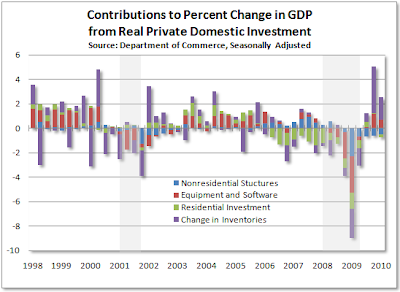 Although consumer spending appears to be declining again, strong inventory rates are helping to sustain the US recovery. See the following post from The Mess That Greenspan Made. In the last of three readings for U.S. economic activity during the first quarter, the Commerce Department reported that growth was revised downward, from a seasonally adjusted annual rate of 3.0 percent to 2.7 percent. This follows an impressive expansion at the rate of 5.6 percent during the fourth quarter of last year following the end of The Great Recession, now widely believed to have occurred sometime last summer. The change for the first quarter was a result of downward revisions to personal consumption and net exports that more than offset upward revisions to inventory, what has been the primary driver for the U.S. economy since last summer as shown below. 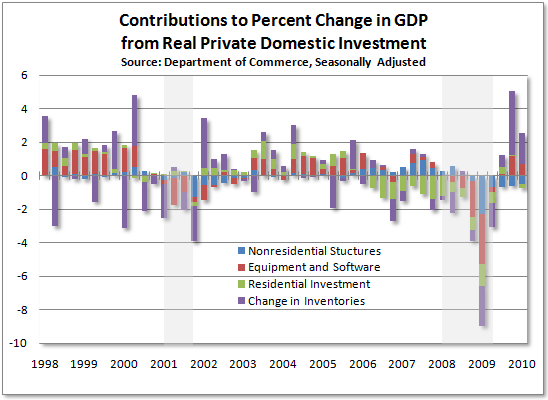 Note how big a role the change in inventories has played in recent quarters. After being a major factor in the contraction as manufacturers slashed production amid great uncertainty about business conditions beginning in late-2008, inventories have been rising sharply for three quarters. 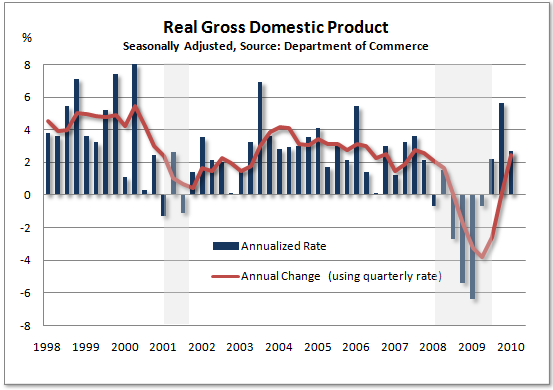 The change in inventories alone accounted for a full 1.75 percentage points of the just revised first quarter growth rate of 2.7 percent after contributing 0.54 percentage points to the overall 3rd quarter rate of 2.2 percent and then more than three-quarters of the 5.6 percent rate in the fourth quarter of last year. Without the manufacturing rebound, this economic recovery would look very different, particularly now that the consumer appears to be fading again.